Americare offers professionally trained caregivers to assist you with your daily needs. Our caregivers are trained to work with the specific needs and challenges facing veterans and their families. We thoroughly screen each individual caregiver to ensure we provide only the best service to our nation’s veterans! A Homemaker or Home Health Aide can come to a Veteran’s home and help the Veteran take care of himself and his daily activities. 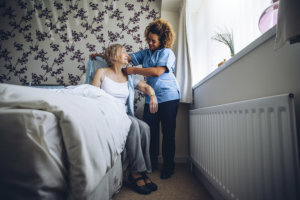 Homemakers and Home Health Aides are not nurses, but they are supervised by a registered nurse who will help assess the Veteran’s daily living needs. The Homemaker program is for Veterans who need help with activities of daily living. This program is also for Veterans who are isolated or their caregiver is experiencing burden. Homemaker and Home Health Aide services can be used in combination with other Home and Community Based Services (such as services you receive through Medicaid or Long-Term Care insurance). Whatever your specific healthcare needs require, we GUARANTEE that we will find you the program you will qualify for!